Julia Cutler Interior Design is a full service interior design firm located in Boston specializing in residential design and decoration. Regardless of scope or size of project, Julia works one-on-one with each client and welcomes a collaborative approach to the overall design. Julia has the keen ability to listen to her clients and to translate their wants and needs into a beautiful and functional home interior. Her sophisticated and creative vision integrates simple, timeless designs with the architecture of the home tailored to reflect the client's individual lifestyle. Julia’s background features outstanding academic preparation and holds a Masters in Interior Design from the University of Massachusetts, Amherst as well as a BA in Romance Languages and Art from Mount Holyoke College. After ten years of apprenticeship with two nationally recognized design firms (Bierly-Drake Associates and Lisa Vandenburgh in Boston, MA), she launched Julia Cutler Interior Design. In addition to her residential projects in Boston and greater New England, she has traveled extensively working on projects in San Francisco, CA, Scottsdale, AZ, Vail, CO, Naples, FL, Oahu, HI, and Osaka, Japan. 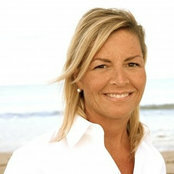 Julia is a member of the American Society of Interior Designers. Typical Job Costs:$50,000 - 500,000Price range varies based on specific project and needs of the client. 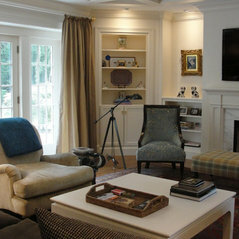 Costs include design services, labor and materials (including finishes and furnishings). Julia Cutler Interior Design inspired me. Her ideas, sense of style and willingness to listen made my decision to hire Julia so very easy. I will hire her again and again. Commented: Can you provide info on pedestal sink?It’s from Waterworks. Commented: Where can i purchase the bed?The bed was custom made by a local upholsterer. Commented: MirrorIt can be purchased through Restoration Hardware (www.restorationhardware.com). Commented: What brand and style is the foyer light?The pendant fixture can be purchased through Nantucket Light Shop (www.nantucketlightshop.com). The table lamp can be purchased through Icon Group (www.icongroupinc.com). 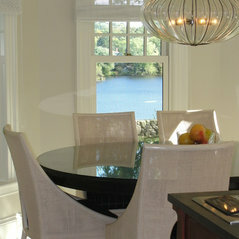 Commented: Love the dining room chandelier- what brand and style is it?The pendant fixture is from Hubbardton Forge. Commented: VanityThe vanity is from Restoration Hardware - the finish is &quot;antiqued grey&quot;.